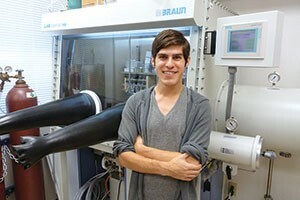 Pepperdine problem solvers are working hard to revolutionize plastic. The next time you pick up a plastic water bottle, know that as you are drinking, research is going on at Pepperdine to develop a less toxic material to contain your water. An undergraduate chemistry team is conducting high-level experiments in their quest to develop a more environmentally friendly plastic for everyday uses like product packaging, disposable cups, medical sutures, and your water bottle. “This is a real world problem and we are doing something to try and solve it, or at least pave the way for it to be solved,” says Angela Longo, a junior chemistry major. With the mentorship of Pepperdine chemistry professor Joe Fritsch, the group’s research involves experimenting with various metals to develop molecules that generate a biodegradable material called polylactic acid (PLA), a polyester derived from renewable raw materials. Most plastic today is petroleum-based; PLA is primarily corn-based, and is versatile in that it can be made to degrade quickly or last for years. The team of students, along with Fritsch, is conducting a number of tests involving mixing compounds, developing new molecules, testing theories, and collecting and analyzing data. It’s not easy work. It can take a long time to accomplish one goal, and the outcome sometimes yields unexpected, but constructive results. But for Longo and her co-researchers, Alexandria McCollum, Logan Schmitz, and Reile Slattery, the rewards that come after the long exploratory process are worthwhile. “You can theorize and plan your experiments to the moon and back, but there's always a result that catches you off guard and it's always a lot of fun to work out what's really going on,” says Schmitz, a senior chemistry major. Researcher Logan Schmitz in the Pepperdine chemistry research lab. What makes this research challenging is the fragility of the molecules, which are killed by oxygen and water. Research must be conducted in a protective antechamber or glove box, a sealed clear container in which users access the interior by inserting their hands and arms into gloves attached to the chamber that allow access to the inside. Fritsch explains that it can be vexing to create something that lasts for only a short time. It took Fritsch and former student researcher Courtney Roberts (’11) three years to learn how to make polylactic acid. On the day they discovered they had finally succeeded, both cried happy tears. “I will always remember that day as when I knew I would be a research scientist for the rest of my life,” recalls Roberts, now a graduate student at the University of North Carolina at Chapel Hill. 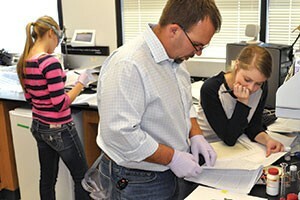 Nearly 20 students have come through the lab in the past eight years that Fritsch has led this research. A large percentage of the students go on to graduate school, while nearly half pursue medical school. Several graduates have been integral to the team’s accomplishments and are spreading the knowledge they developed at Pepperdine. Professor Joe Fritsch and student Kim Gerling review data. Roberts was the first to make PLA at Pepperdine and was awarded a prestigious National Science Foundation Graduate Research Fellowship. Nomaan Rezayee (’12) is in chemistry graduate program at the University of Michigan. He demonstrated that the speed of making PLA can be adjusted faster or slower. Kim Gerling (’14) a U.S. Army officer and medical school student at Uniformed Services University of Health Sciences, demonstrated that second-generation catalysts with zinc were possible. They both completed honors theses related to their respective research topics. The accomplishments continue with the current team. Last year, in Pepperdine’s inaugural Waves of Innovation program, Fritsch and his students won a nearly $70,000 grant to expand their research to include additional metals and polymers. All four current students have presented their findings before thousands of chemists and researchers at the annual American Chemical Society (ACS) national conference and shared information with scientists worldwide. Their many accomplishments have been published in multiple scholarly journals nationally and internationally. “We are making progress in the lab faster than I can write,” Fritsch enthuses. In addition to discovering new compounds and molecules, Slattery, a senior chemistry major, says other benefits she has realized from working on the project include learning to think critically and propel new ideas forward. McCollum has gained technical and motor skills, a deeper understanding and appreciation for various aspects of chemistry, and developed close friendships.